Six (fake) leaked conversations from the royal family group chat. 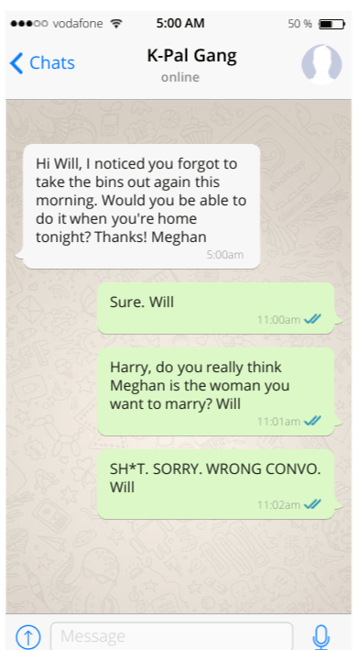 Six leaked conversations from Harry, Meghan, William and Kate's WhatsApp group chat. 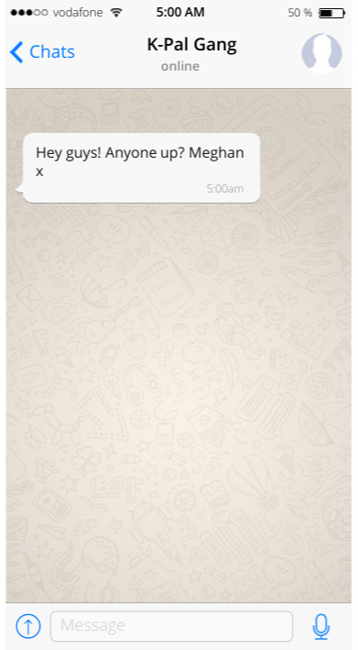 We recently learnt that Prince Harry, Meghan Markle, Prince William and Kate Middleton have their own group chat. 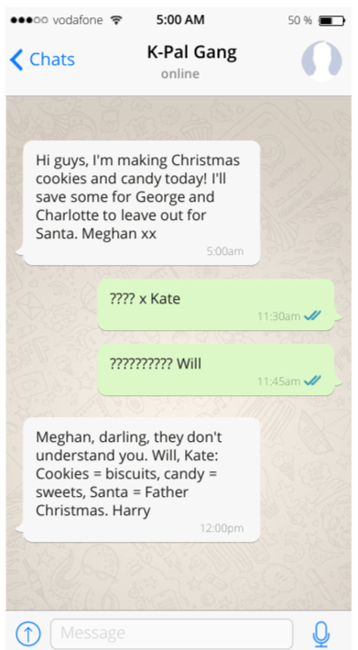 A source told Us Weekly the four royals are “all on a family text chain”. Yes – just like the one you and your siblings have, only royal. (Kidding – we would never hack into anyone’s phone, please don’t report us). …But it turns out we actually don’t need to. Very reliable sources (otherwise known as our own imaginations) have revealed exactly what they talk about within this top secret royal chat. Prince Harry is the meme lord of the Royal family. Prince William types with one finger. 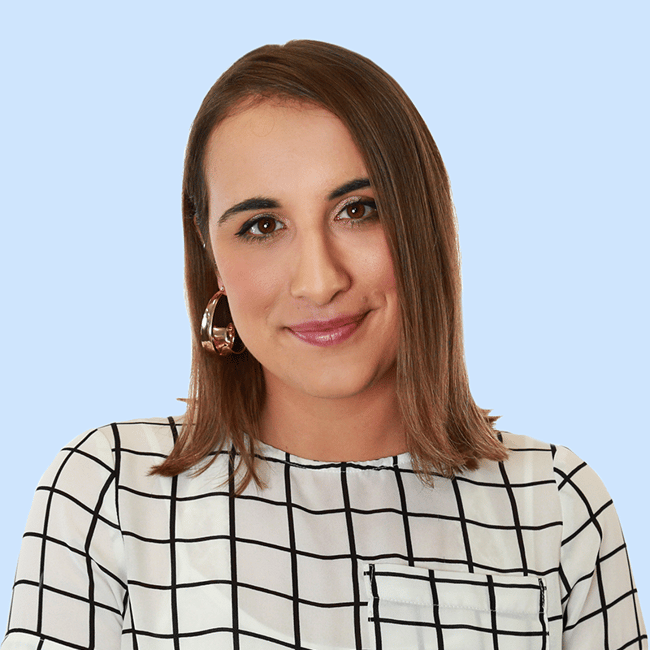 Kate leaves everyone on seen. Here are six conversations that have definitely taken place (read: they are completely made up). 1. No one replies to Meghan’s ridiculously early messages. We’ve all heard Meghan’s widely reported ~difficult behaviour~ involves her early rising. Because HOW ANNOYING is it when people get up earlier than you and… do things… while you’re still sleeping? I mean, gosh, go back to bed mate. But while she’s tried to encourage the gang to join her for early morning yoga, she just can’t seem to get a response. 2. Kate and Will cannot understand Meghan&apos;s exotic Californian dialect. Prince William and Kate Middleton just can&apos;t get their heads around Meghan&apos;s Americanisms. Who is cookies? Where is Santa? ¯\_(ツ)_/¯. 3. 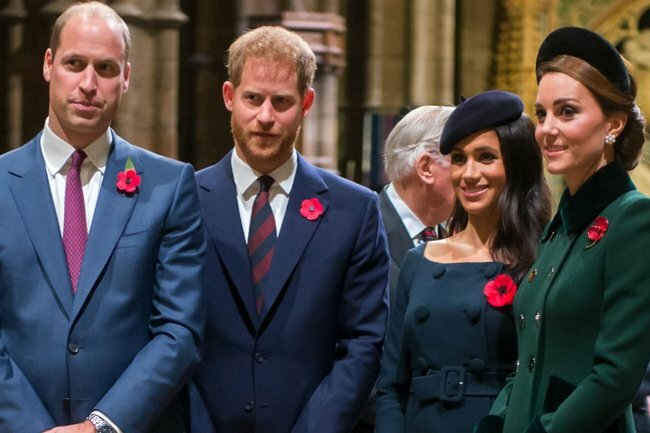 The Duke and Duchess of Cambridge get a kick out of trolling Meghan. It all began last Christmas, when Meghan was struggling with gift ideas. 4. There was a time Prince William f*cked up big time. He pulled the classic "sorry, wrong convo." 5. 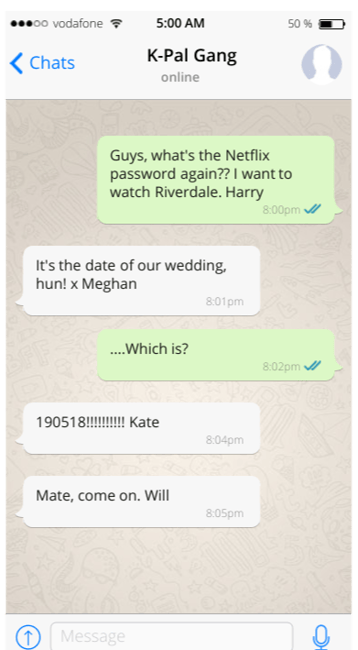 Prince Harry keeps forgetting the Netflix password.